Butterfly Weed Rose Asclepias Incarnata is one of the most beautiful perennial wildflowers that is native to Eastern North America. Butterfly Weed Rose can be grown from seeds, and also known as Swamp Milkweed or Rose Milkweed, Asclepias Incarnata grows up to four feet in height producing a large number of showy flat-topped clusters of deep-pink to red blooms. Swamp Milkweed blooms all summer long, and lovely vanilla-fragrant clusters of small carmine-rose flowers attract Monarchs along with other butterflies. Butterfly Weed is a favorite host plant for the Monarch butterfly caterpillar. Butterfly Weed Rose is an important addition to any butterfly garden, and this attractive wildflower is also often planted as a bordering plant or grown in meadows. 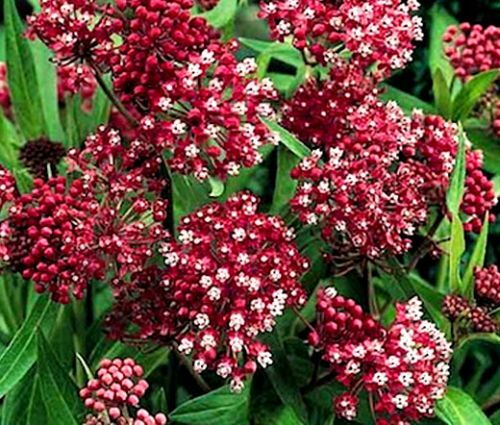 Asclepias Incarnata seeds cannot be covered, because they need light to geminate, and Swamp Milkweed grows best in full sun preferring consistently moist soil and tolerating partial shade and average, well-drained soil. The established plant is care-free and tolerates heat and humidity. Butterfly Weed makes a nice, long-lasting cut flower, and this plant is an outstanding choice for fresh and dried bouquets.